A few years ago the city of Boise experimented at one of the local parks. They opened the soccer fields in the park to off-leash dogs from late fall until early spring. Did they do this in consideration of all the dog owners out there who like to see their dogs run free? I suppose that could have been one reason. But the true driving force in this decision was geese. The geese live in the city year-round, hanging out at the parks. Those of us who share our cities with geese know what happens to the parks where they hang out. Just ask the city of Portland, Oregon. They spent $3.7 million on a new park that was promptly overtaken by geese, leaving it completely unusable for people. Geese are very, very messy animals. This is where the dogs come in. 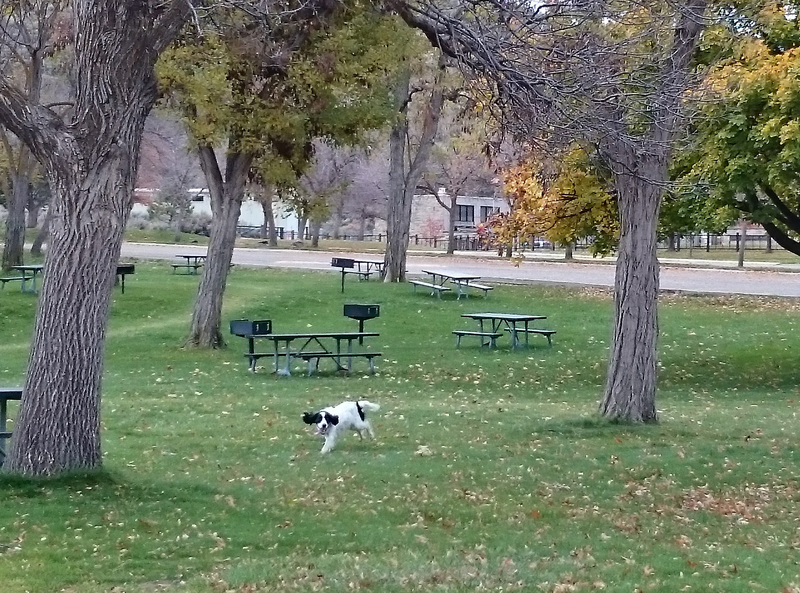 Boise allowed people to bring their dogs to the park and run free on the soccer fields. And – surprise! – in the spring the soccer fields, which previously had been covered in goose poop at the start of the season, were free and clear of goose poop. The city has continued its practice of opening the fields to off leash dogs each year since this first experiment. We took A.J. there a couple of times last year. It’s obvious where the off-leash area is – it’s the only part of the park not covered with geese. The park is across town from where we live, so we didn’t go often. Plus A.J. isn’t always good about staying in boundaries that aren’t so obvious from a dog’s point of view. But this year, the Idaho State Parks decided to follow suit in the geese reduction efforts. They’ve opened two new parks to off-leash dogs for the winter. Both parks are a quick and easy drive from our house. The dogs get the run of the entire park, so the boundaries are pretty obvious. Today we took A.J. down there for the first time. One of the two parks we’d visited with A.J. previously, but the other had never allowed dogs, even on leash. (It’s a “sensitive wildlife area” in the summer.) So we took A.J. to the “new” park. I wasn’t sure how well this was going to work. A.J. hadn’t been very good lately about coming when called, so we started out with the 15 foot leash. I let him sniff around and explore at the end of the long leash, then told him to “Come.” He came right away. We did this a few times and he always came back immediately, so I took the leash off. After exploring for a few minutes, I yelled “A.J., Come!” A.J. didn’t come. Fortunately he didn’t actually run off either, so I walked up to him and hooked the leash back on. We practiced on the long leash again. At one point I handed Greg the leash. This allowed me to walk farther away before calling to A.J. He came every time. So I took the leash off again. From then on he did much better. We’ll most likely go through this exercise each time we go to the park, but hopefully he starts to realize his freedom depends on how well he listens to me. So, thanks to the messy, poopy geese, A.J. gets to spend the winter running around like the crazy, energetic dog he is. Thank you poopy geese and Idaho Parks and Recreation. A.J. running free in the off-leash park.